In July 2015, Microsoft stopped supporting Windows Server 2003. The end of support will create serious security issues, especially if you are not fully migrated to a new platform. Hackers know this and will be targeting new exploits at the significant number of Windows Server 2003 servers still in use. In the absence of security patches from Microsoft, exploits aimed at vulnerabilities such as Shellshock, Heartbleed, and FREAK, will be especially dangerous. And the risks of running Windows Server 2003 after the end of support will increase over time as more issues are found and exploited. While migrating to a supported platform as soon as possible is a natural option, it’s understandable that many enterprises simply may not be able to do so before the end of support. If you will be using Windows Server 2003 after July 2015, you’ll need to put security controls in place to detect and protect your workloads from attacks. 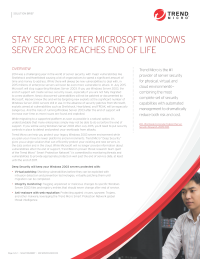 Download this solution brief to learn how Trend Micro can help you protect your legacy Windows 2003 server environment while you plan your move to newer platforms and environments. Trend Micro Deep Security gives you a single solution that can efficiently protect your existing and new servers, in the data center and in the cloud.